Cara's Weight Loss Journal: Who craves crispy granola bars?? 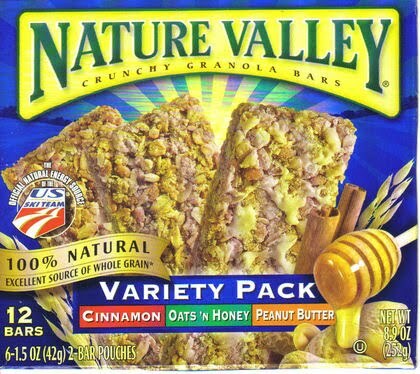 A couple of years ago, heck, just last year, no way you'd catch me eating a crunchy granola bar much less enjoying it! But man! I think I'm in love! I bought a variety pack of cinnamon, peanut butter and oats n honey and I can't decide which one I like best! Publix was having a sale, is the only reason I even bought the box. If you bought a box of Cherrieos, you'd get a free box of Nature's Valley granola bars. Well, it was free, so what the heck. Now... Mmmmm! I'm hooked! You know something else I'm enjoying lately, though not NEARLY as much as the granola bars is my spearmint Extra sugar free gum. I kept hearing Bob Harper saying, "chew Extra sugar free gum in between meals to fight off the munchies". 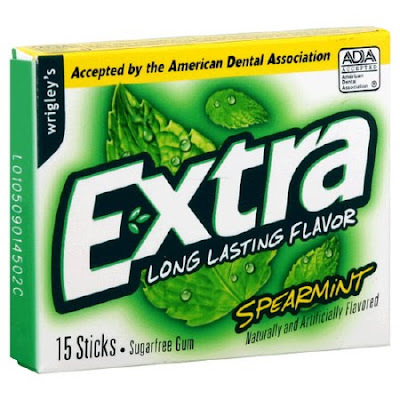 For me, gum does nothing but make me crave more munchies. Its like my body gets a taste of the sweetness and just wants more. But being as I only chew the spearmint, I can't crave anything else because if I did, it would taste all minty. I wouldn't be able to taste it at all. So instead of it fighting the cravings, it actually helps me must stay out of it altogether. So how have you guys been doing tracking this week? I've been doing good. I tracked every day, so far. I kept forgetting to stick my tracker in my purse each night so I kept writing my food down on sticky notes and then copying them down when I got home. But today I finally remembered to put it in my purse. I'm finding it very hard to stay below 22 points a day. 21 points is just NOT enough. And I'm eating small portions and healthy food and all the right stuff, but it's so hard to stick to the 21 a day. That's 20 points and I haven't had my evening snack. I don't have any 1 point yogurts left so I'm going to have to have a 2pt snack. I'm finding each day that I'm over 1 to 2 points. As hard as I try, I just can't stick to the 21 points. Oh well, at least I'm close, right? So tell me, how are ya'll doing with your tracking? Ahhh the free box suckered you in! tee hee hee. The bars that suckered me in because I got a free box....the Chex bars. (chocolate or turtle flavored). I've not had the best week eating wise...but I have to say that I've tracked each and every last bite that I've eaten! Starting Monday the Black Kitteh and I are going to be tracking again. I can't say I am looking forward to it, but alas, it is something that NEEDS to be done! It's always shocking to me how much garbage I can eat in a day, and think I am doing just fine point wise. Tracking always helps me stay a bit more focused! As for granola...it's like crack to me. I can't eat it in small quantities...if I have just a little, it turns into a full blown binge, so I have to "avoid" all together. :( Hope you have a great weekend!! I'm glad to hear you all have done so well tracking. It's NOT easy! I absolutely HATE it. But its what we must do to lose, right? !